Bikini razors and trimmers are often overlooked by beauty industry media. In fact, most people would shy away when talking about products that are made for trimming delicate areas. It’s high time that we tackle some of the best bikini trimmers to keep things neat “down there”. Have You Used A Bikini Trimmer? Every girl has a favorite method when dealing with unwanted hair. From epilators to depilatory creams, you can definitely find a technique that fits you. One of the more traditional ways is to use a razor. You’d think that they would be outdated, but many women still use them. The concept of shaving hair may seem quite easy. You might be thinking that there’s not much difference in shaving your bikini line. With that said, a razor should be enough to get the job done. But unfortunately, it’s not as easy as it looks - that’s when a bikini trimmer comes in. Your bikini line is a very sensitive area and a regular razor can potentially irritate. Using razors without proper care can lead to different other problems such as ingrown hair, nicks and razor bumps. I don’t know about you but ingrown hair “down there” sounds painful to me. A bikini trimmer has features that are specifically made for hair “down there”. The method is far more gentle and will not cause much irritation on the skin. Can you count how many razors you have disposed of ever since you started using them? Traditional razors need to be replaced very often to keep things sharp and hygienic. A bikini trimmer will stay with you for the long run with proper care and maintenance. You may be thinking that bikini trimmers cost a fortune to purchase, but there are plenty affordable, high quality brands. Many of them are in the list below. A regular razor will not be able to shave off all areas of your bikini line. Some areas are just too “tight” for a traditional razor to accurately trim. Many people assume that they can work their way through with a plain old razor but doing so can potentially lead to unwanted razor mishaps. A great bikini trimmer will come in an ergonomic design that’s specifically made for easier reach and shave. Most bikini trimmers will feature a flexible head that hugs the contours of your skin, allowing it to glide smoothly across the desired area. A traditional razor is meant to deal with thicker and coarser hair; this is primarily the reason why its blades are a lot harsher than a bikini trimmer. Although both may feature hypo-allergenic blades, you can expect the blades to be a lot more protective than regular razors. Cheaper razors also require you to change its blades often unlike bikini trimmers. In terms of longevity of use, a bikini trimmer will definitely outlast any other razor in the market. A regular razor is only meant to give you a clean shave. But a good brand of bikini trimmer will most likely come with a precision comb which can allow you to get the length that you want. Women who prefer not to be completely naked “down there” should opt for a bikini trimmer. The problem with razors is that you may need to go over the same spot twice to get a clean shave. Doing so may cause razor burns and irritation. A bikini trimmer with a function to cleanly shave your private areas have blades that closely hug the contours of your body. Such function is needed to avoid getting cut in very delicate areas. Invest in a bikini trimmer set that will allow you to get a cut or shave that you prefer. Grooming methods aside, there are also plenty of bikini trimmer brands being sold today. The list below features 5 of the best bikini trimmers available. This ranking covers many different aspects from design to additional features. Hopefully, it will guide you in making a purchase. The Schick Hydro Silk TrimStyle is a versatile razor that comes with a bikini trimmer. Although it isn’t originally a standalone bikini trimmer, this razor made its way to this list because of its superior design and skin hydrating features. Many people find that shaving dries out their skin. This is because shaving with razors also tend to deplete your skin’s needed lipids to keep it moisturized. The best part about the Schick Hydro Silk is that it comes with the brand’s signature hypoallergenic moisturizing serum. Paired with five curve sensing blades and the moisturizing serum, this razor can achieve a close trim that glides smoothly across the skin while hydrating it at the same time. The Philips Bikini Trimmer boasts off a very feminine design. It is definitely one of the slimmer options on this list, making it a very good size to reach all areas. It comes with two heads: a bikini trimmer and a shaver head. It also has a precision comb to help trim hair accurately. If you’re looking for a simple bikini trimmer to get the job done, this is the best option for you. The two heads allow you to choose between a simple trim or an all out shave. The size is also just right - not too long or awkwardly shaped. The design is easy to handle during use as well. There is nothing that other bikini trimmers that the Panasonic ES2207P cannot offer. This bikini trimmer comes with a three floating head system. Each head features sharp blades for easy shaving. The head is designed to follow the contours of your body, allowing a smooth glide. 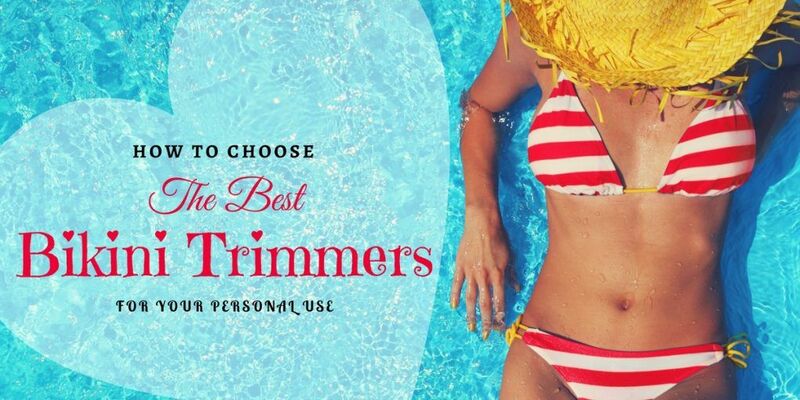 But if there’s anything special about this bikini trimmer, it would have to be its convenient pop-up trimmer - there is no longer a need to change heads. The body itself is cordless, but it comes with a compact charger in case power runs out. No need to go out and buy batteries! If you are looking for something close to a classic razor, the Philips LadyShave may be your best bet. The body’s design is clean and classic, making it very easy to grip while in use. Although it does not come with much special features, its blades are sharper than others. The Philips LadyShave is battery operated and can be used wet or dry. It is said to promote softer and smoother shave compared to other bikini trimmers. The Gillette Venus is probably the most commonly used razor blade in every household. Although not exactly a trimmer, this product made it to this list because of its clean and smooth shave. If you are looking to completely remove unwanted hair, this razor is for you. This razor is popular for its 5 signature curve-hugging blades. Each blade has a ribbon of moisturizer that helps keep your skin hydrated even during your shaving session. The moisturizer ribbons also provide an easy glide without much water. The design of this razor is also very lightweight and simple to use. It allows you to conveniently manipulate the razor, making it a lot easier to reach all areas of skin. Refills for this product is also very affordable and can be found easily compared to other bikini trimmers. A lot of women are still on the fence about using bikini trimmers because they can come off as intimidating at first glance. It’s not so often that we discuss openly about matters related to sensitive areas. It’s only natural that we wonder and or fear the aftermath of trimming. Rest assured, bikini trimmers are made to groom such delicate areas. Tell us your stories about grooming “down there” - have you used a bikini trimmer before? And if you have any questions, feel free to comment down below. I would love to answer them!